Ever wonder what happens to all those chicken bones after you eat your chicken, or the ribs from barbecued ribs or rib eye steak? Sure, they end up in the trash, but one man’s trash is another’s treasure. Eventually, your garbage ends up in a landfill and is buried. 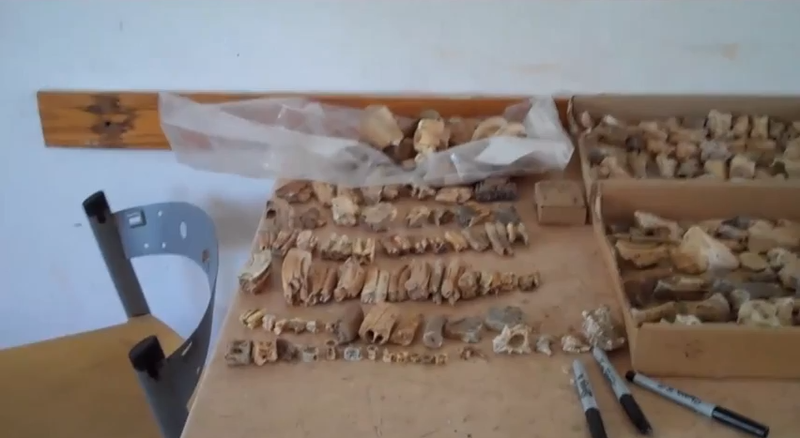 Archaeologists make it a habit of digging up ancient trash, and one of the things we dig up are animal bones. How did they get there? That’s usually easy. If they are a small rodent, we usually know that it just died in its burrow and we found it. But bones from sheep, goats and cattle, or deer are generally considered to have been supper. Here at Tel Akko we find our share of bones. Long bones, foot bones, cattle, sheep and goat bones. They usually appear in the screen when we are sifting dirt. Sometimes, especially with the larger pieces, they are seen in situ, in place and removed. Occasionally, these bones will show signs of butchering. Straight scratches or marks on the bones where meat was cut off. That’s very cool. Think, the last person before me who held this bone, used a knife and cut meat off to eat. That’s quite a connection to the past and one that nearly everyone can understand. Sometimes the bones are not of food animals, but predators or other, odd animals. Perhaps a wild dog, wolf or jackal. Occasionally, truly unusual bones are found. A small piece of a pigmy hippopotamus or a bone from a bear’s paw. How did these bones get into the city’s trash? Who knows? Did some child bring home a bear’s paw or was it killed because it was harassing the inhabitants? There isn’t any way we will ever know the answer to where odd bones come from, but it tells us that the animals were there, in the neighborhood. Just like the skunk that lives somewhere near my house in State College, but takes refuge in my window wells during rain storms, it is impossible to understand why. At Akko we are left with a small part of the animal – a bone. At home, I’m just left with the aroma.